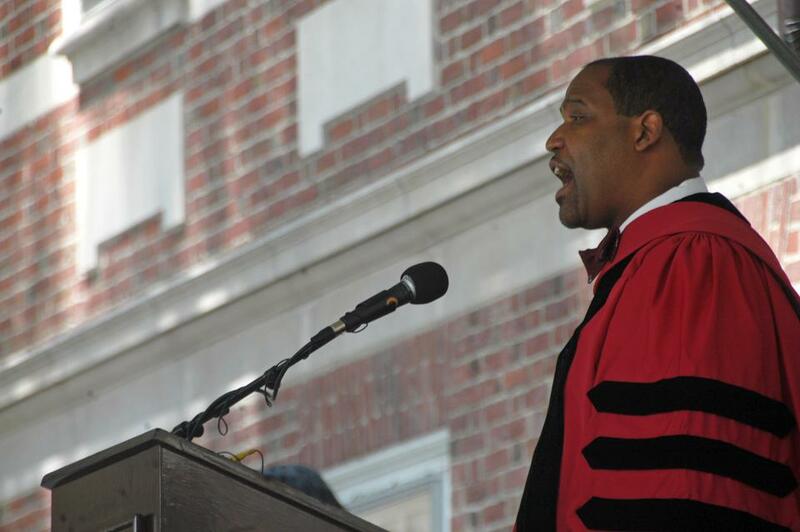 Winthrop House Faculty Dean and Law School Professor Ronald S. Sullivan, Jr. speaks at a diploma ceremony in 2010. The survey asks students a series of questions about whether they feel welcome in the House. It also asks them to score Winthrop on a five-point scale based on whether they believe the House is “hostile” or “friendly,” “contentious” or “collegial,” and “sexist” or “non-sexist,” among other metrics. Dean of the College Rakesh Khurana announced that former Dean of Freshmen Thomas A. Dingman ’67 would lead a “climate review” in an email to Winthrop residents on Feb. 25. Khurana wrote that the College decided to launch the review after hearing concerns surrounding support structures for students in the House following Sullivan’s decision to defend Weinstein. The College review offers two opportunities for Winthrop residents to share their opinions: the questionnaire sent Tuesday, and meetings with Dingman and another College official. In an email sent to House affiliates on Feb. 27, Dingman wrote that he is currently in the process of selecting another person to help him run the inquiry. He added that he will share feedback with Khurana, who will then present it to Sullivan and co-Faculty Dean Stephanie R. Robinson. “Your participation in this process is entirely voluntary, and you are under no obligation to speak with me or my colleague. That said, the information we gather will necessarily only reflect what was provided to us, and I do hope we have the benefit of many views in this process,” Dingman wrote. Sullivan has drawn criticism since the New York Post first reported Jan. 25 that he would join Weinstein’s legal team. Weinstein currently faces five charges of sexual assault in a Manhattan court. In the following weeks, Sullivan sent two emails to House affiliates. The first argued for defense lawyers’ responsibility to represent the “unpopular defendant.” The second outlined a set of processes in Winthrop going forward, including designating Resident Dean Linda D. M. Chavers as the “point person” for issues of sexual misconduct. In response to Sullivan’s decision to join Weinstein’s defense team, some students started protests and wrote open letters calling for his removal as faculty dean. The survey sent Tuesday begins with a question about students’ level of satisfaction with the House’s climate. It continues by asking students to indicate their level of agreement — from “Strongly Agree” to “Strongly Disagree” — with a series of statements evaluating their experiences in the House. Another question asks students to rank the House on 12 different characteristics including disrespectful or respectful, elitist or non-elitist, homophobic or non-homophobic, and racist or non-racist. The survey closes with two demographic questions and a space for additional comments. The College will use the results gathered from Winthrop affiliates to guide any further action, Khurana wrote in his original email.